The Middle Ages saw a tremendous explosion of architecture all over Africa as Africans became richer than they had ever been before. 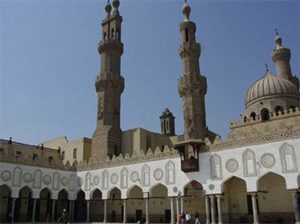 In Egypt, the Fatimids built mosques and forts, and the new city of Fustat (Cairo). More trade with India made the people of East Africa finally rich enough to build stone palaces, houses, city walls, mosques, and churches. 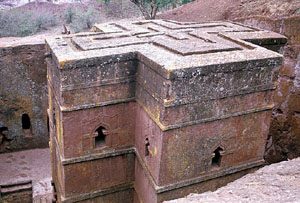 Like their trade partners in India, Ethiopian and Sudanese Christians often cut their churches out of the living rock instead of quarrying stone. Further south, in Zimbabwe, they still weren’t rich enough to build stone buildings, but more trade in ivory and gold at least made people rich enough to build in mudbrick. 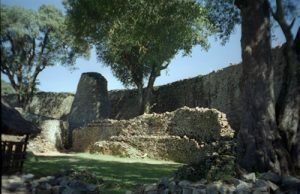 By around 1200 AD, as trading increased, people in South Africa were rich enough to build in stone at Mapungubwe and Thulamela (in modern South Africa) and Great Zimbabwe. All across North Africa, people rich from trading with West Asia and the Italian city-states of Europe built many fine stone forts, castles, and city walls. The new Islamic rulers abandoned many old Roman towns, building new cities next door. The people of Alexandria moved to Fustat (now Cairo); the people of Carthage moved to Tunis. 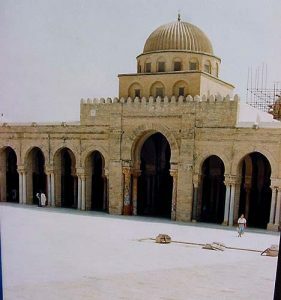 The new city of Kairouan, the fourth holiest city of Islam after Mecca, Medina, and Jerusalem, grew out of the desert. New towns needed new buildings, especially mosques and minarets. By this time, enough trade caravans were crossing the Sahara that West African people could afford to build bigger towns too. In ancient Ghana (now southern Mauretania), rich traders lived in stone houses, and attended stone mosques. The new cities of Oualata and then Timbuktu (in modern Mali) were still mostly built out of mudbrick, but on an impressive scale. At nearby Djenne, there was a much bigger mudbrick mosque. 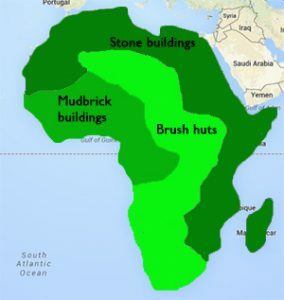 Even further south in Ife (now southern Nigeria), by 1000 AD the Yoruba people were living in mudbrick houses; they paved their courtyards with broken pottery. A hundred years later, about 1100 AD, there was a wall around the city of Kano, in northern Nigeria, too. The late Middle Ages kicked architecture up another notch in West Africa and Central Africa: by that time, Mansa Musa in Mali had brought home a Spanish architect to build baked brick buildings. By the end of the 1300s, traders from West Africa were regularly buying ivory, iron pots, and raffia cloth from people along the Congo river (in modern Congo), and large-scale mudbrick architecture spread as far south as the capital of Congo, Mbanza Kongo. Did you find out what you wanted to know about medieval African architecture? Let us know in the comments! Cite this page: Carr, K.E. 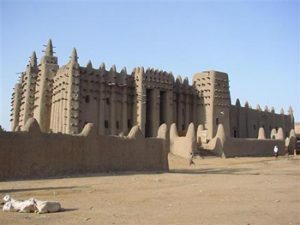 Medieval African Architecture – Mosques and Churches. Quatr.us Study Guides, May 18, 2017. Web. April 25, 2019. Is it possible to elaborate on the structures of buildings and why they were built? Thank you very much. This answered my questions and I found it very helpful! Did they have plaster, mortar, and concrete? Cisterns? Tunnels? Was mudbrick baked? Paint? Glaze for pottery? The answers to most of these questions are in the article above. You might also check out this one: https://quatr.us/africa/early-african-pottery.htm and this one: https://quatr.us/egypt/pottery-ancient-egypt.htm . Yes, people in North Africa and in Sudan used cisterns, and in North Africa they built catacombs – tunnels underground to bury cremated remains in.